House Speaker Dennis Hastert denied Thursday that he pushed for federal funding for a proposed highway in northeastern Illinois so he and his wife could reap about $1.8 million from land deals near their home in Kendall County. The Sunlight Foundation, a newly created group whose declared aim is to inform the public about what members of Congress do, has accused Hastert of not divulging connections between the $207 million earmark he won for a highway, the Prairie Parkway, and an investment he and his wife made in nearby land. The Foundation says Hastert used an Illinois trust to invest in real estate near the proposed route of the Prairie Parkway, and notes that Hastert's 2005 financial disclosure form, released Thursday, makes no mention of the trust. Hastert lists several real estate transactions in the disclosure, all of which were done by the trust. Kendall County public records show no record of Hastert making the real estate sales he made public today; rather, they were all executed by the trust, the Foundation says. However, Hastert disclosed the transactions on the annual personal financial statements members of Congress are required to file, the Chicago Sun Times reports. But Hastert did not take the extra steps called for in the House Ethics Manual and volunteer that he held land in a secret land trust called "Little Rock Trust," the newspaper says. 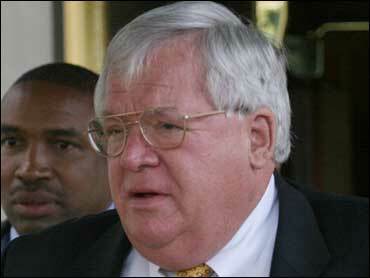 In defending himself, Hastert told The Associated Press the land in question was 5.5 miles from the proposed highway. "So, it has nothing to do with the Prairie Parkway," the Yorkville Republican said. "I owned land and I sold it, like millions of people do every day." Hastert attorney Randy Evans wrote to the foundation, calling its statements false, libelous and defamatory, and demanding that they be withdrawn and corrected. Among Evans' criticisms was that the property Hastert purchased is adjacent to Hastert's home and is more than 5.5 miles from the Prairie Parkway corridor. "This would be like complaining about a purchase in Alexandria, Virginia, based on renovations at the Capitol," in Washington, D.C., he said. Hastert business partner Dallas Ingemunson, a former Kendall County state's attorney, questioned the use of the 5.5 mile estimate, saying the distance was "probably less than three miles... as the crow flies." But he agreed with Hastert that the Prairie Parkway had nothing to do with their land deals. As The Washington Post reports, in February 2004, Ingemunson, who was also treasurer of Hastert's campaign committee and chairman of the Kendall County Republican Party, established Little Rock Trust. A week later, through the trust, Hastert and his business partners purchased a 69-acre parcel for $340,000, providing road access to part of Hastert's farm that had been landlocked. Hastert owned a quarter of that parcel. The approximately 138 acres was bought for about $2.1 million and later sold for almost $5 million, or nearly $3 million more. The Hasterts were sole owners of one parcel bought in May 2005; Hastert and Ingemunson each had a quarter-interest in the other tract, bought in February 2004, with longtime Hastert friend and supporter Tom Klatt having a half-interest. Based on Ingemunson's figures, Hastert paid roughly $259,000 for one parcel and later pocketed about $621,000 from its sale; and the speaker paid about $1.03 million for the other parcel and later reaped $2.48 million. Altogether, Hastert turned about $1.3 million in investments into about a $1.8 million profit in less than two years. Ingemunson said Wallanches sold his property at a relatively good price for the buyers because the farmer was worried that the "bubble" was about to burst in the local real estate market. He said the subsequent property value was in line with fast-rising real estate in Kendall County. For years, Hastert has pressed for federal support of the proposed north-south access road to meet the transportation challenges of Chicago's suburbs, including Kendall County, one of the fastest-growing areas in the nation. His pitch for the parkway had bipartisan support within the Illinois congressional delegation. When President Bush last summer signed the multiyear transportation bill that included Hastert's Prairie Parkway, he even mentioned the connector road designed for joining two major highways. In explaining the transactions, Hastert spokesman Ron Bonjean backtracked to before 2004, when the Hasterts, using proceeds from selling their Yorkville residence and other assets, bought a 195-acre farm in Plano to serve as their new home. About 70 acres of that land was hemmed in by other landowners, so Hastert bought additional acreage with Klatt and Ingemunson to give his farm frontage road access, Bonjean said. Bonjean said Hastert borrowed money from his bank to pay for the quarter-interest in the adjacent property, and he said the loan was made on commercially available terms and fully secured by the value of the property. In late 2005, Hastert sold 68.9 acres of his original 195-acre farm plus the 69.55 acres he and his partners had an interest in, Bonjean said. The speaker then bought 275 acres in Crawford County, Wis., for a possible future vacation home and, on equal footing with Klatt and Ingemunson, bought 126 acres in Kendall County. "The Prairie Parkway was never a factor in these transactions," Bonjean said. "None of the properties purchased by the speaker are near enough to the Prairie Parkway to be affected by the proposed highway. ... When the property was purchased they did not know the Prairie Parkway was going to go down that route." Anthony Casaccio, a Chicago-based real estate developer who says he owns several thousand acres in Kendall County, said he recently bought and sold commercially zoned property in the area where Hastert made his purchases and more than doubled his money in about two years. "Depending on location and proximity to sewer and water, you could see easily doubling your money in a short period of time," said Casaccio, who said he was not a campaign contributor to Hastert and was not active politically. Bonjean referred a reporter to Casaccio, saying he was expert in real estate matters in Kendall County. Bill Allison, a spokesman and researcher for the Sunlight Foundation, said he would like to see paperwork from Hastert to back up the statements made by his staff and Ingemunson. He said too little is known about the transactions because much of the wheeling and dealing in real estate involved a trust, and, under Illinois law, it is difficult to learn about the details of transactions involving trusts. Keith Ashdown, vice president of the group Taxpayers for Common Sense told the Washington Post that after chronicling Hastert's efforts to secure the parkway funding, he also remains suspicious. "The facts are the facts," he told the newspaper, "and the facts are, he made a lot of money off this deal, and he was the one who got this earmark."